The excitement around the Olympics in London this summer is growing, and there are many companies, organisations and individuals preparing to have associated events. 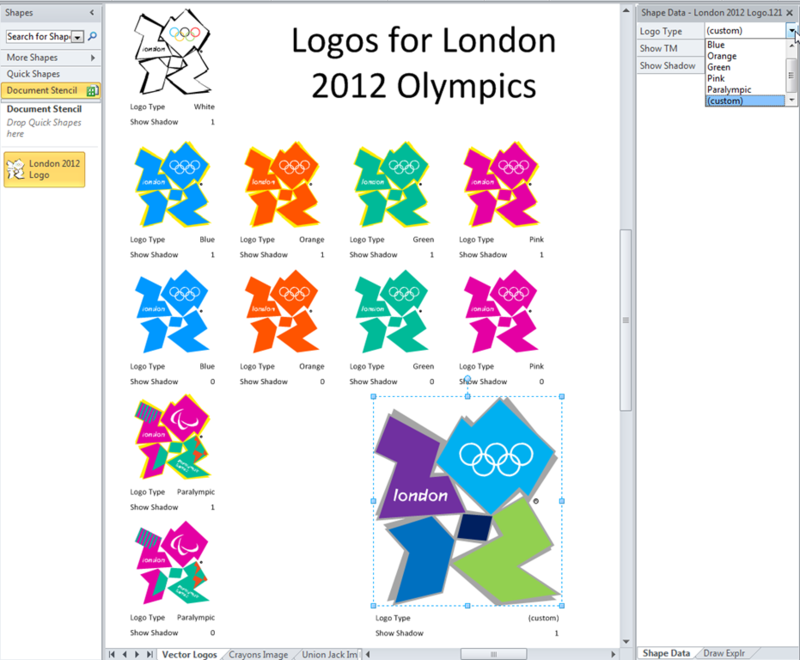 Therefore, I thought it would be useful to have Visio versions of the logos available. 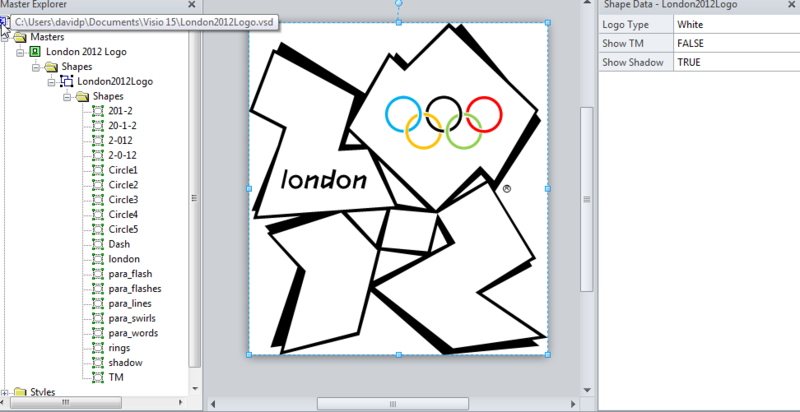 I downloaded the original SVG files from http://en.wikipedia.org/wiki/File:All_London_2012_logos.svg, and then opened them in Visio. Once I had them in Visio, I was able to slightly clean them up by combining some of the resultant shapes, then I renamed the shapes to make them easier to explore. I then made a single master shape, with three Shape Data rows to allow the user to select between six different official colour versions, and a custom option to allow you to sub-select shapes to format as you like. I also enabled the shadow to be switched off, and the registered trademark logo to toggle between two different appearances that I found on the web. I have added a right mouse menu to change the Shape Data rows, and there are triggers in the User-defined cells to return the formatting to the official visuals when the Logo Type value is changed. 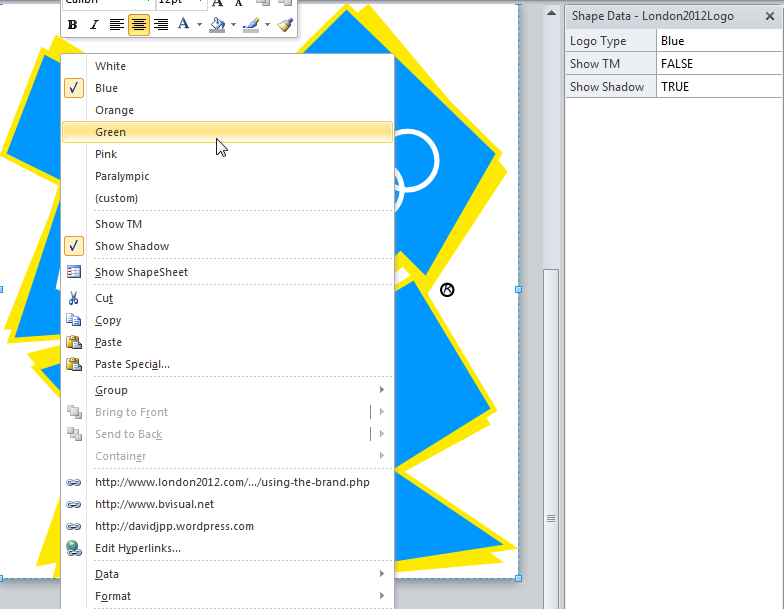 I do not claim any copyright of this Visio shape, and you should study how you are allowed to use the brand at http://www.london2012.com/about-us/our-brand/using-the-brand.php. I have added this hyperlink to the shape, along with a couple to my own websites. The Olympic rings in the White(and Black) version were a challenge because they were not available in the original svg. So, I created a special circle that has two optional gaps, controlled by Shape Data values. I could then simply duplicate this circle shape, select the number of gaps required, and rotate/flip and colour the shape as required.